﻿ EYE - "Center Of The Sun"
EYE - "Center Of The Sun"
I'll be the first to admit that I'm criminally out of touch with what's going on in my own backyard. So sometimes I discover a hot Columbus, Ohio band when they're opening for someone else, and that's how I discovered EYE. I had gone to see La Otracina a while back and EYE were one of the opening acts, and I was stunned to hear spaced out guitar á la Hawkwind and early 70s influenced heavy Prog. I saw them again earlier this year opening for White Hills, and now, finally, comes the announcement that their first album is available. 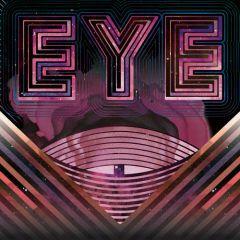 EYE are the trio of Matt Auxier on guitar and vocals, Matt Bailey on bass, and Brandon Smith on drums and vocals, with Adam Smith contributing organ, Mellotron, ARP 2600 & Moog synths to the album. Center Of The Sun opens with the nearly 20 minute long title track, which starts off like we're hearing some lost track from Hawkwind's Space Ritual. After an intense spaced out buildup the vocals kick in, singing about a journey to the space beyond, and then BAM!... stoned metal guitar, Mellotron, and we're in full blown early 70s spaced out heavy Prog mode. But EYE also explore stoned Black Sabbath styled themes, with the lyrics at all times being otherworldly and mystical. Hawkwind, Sabbath, shades of King Crimson at their most menacing, multiple thematic transitions, it's all here on this tune. As a child of the 70s any time I saw critics use the terms 'pompous' and 'bombastic' I couldn't grab whatever album they were slagging quick enough, knowing that I was going to be delighted, and Center Of The Sun is a glorious retro experience that fits the bill. Usurpers is next and is an 8 minute slab of powerhouse stoned space rock and metal. This sucker rocks hard throughout and includes some killer guitar. Usurpers segues seamlessly into Restorers, which is similar to the opening title track. Much of Restorers struck me as a kind of spaced out King Crimson, but also early 70s heavy rocking Prog-Psych. When they're rocking out the band are really tight and again we get more excellent ripping guitar. Rik Rite is the final track, which comes roaring out of the starting gate with guns blazin', but soon settles into a flowing, even serene, segment with Mellotron and a flute-like sound. But things quickly get dark and ominous, with a slow moody buildup that explodes into a monster Prog-Space-Psych rocking jam. Wow, Mr Peabody has set his wayback machine to circa 1970-72, and if that appeals to you then I can't recommend Center Of The Sun highly enough. The album is available as a vinyl LP and comes with a download code.